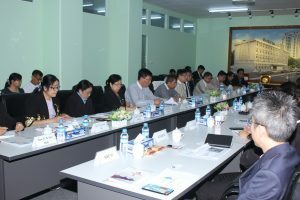 The Securities and Exchange Commission of Myanmar organized the 1st Round table Meeting for the capital market development, and it was held at the Office of SECM on 23rd, March 2019. A total of 35 participants led by U Maung Maung Win, Chairman of the Securities and Exchange Commission of Myanmar and Deputy Minister of Ministry of Planning and Finance, Member of SECM, Managing Director and officials from Yangon Stock Exchange, officials from DICA, IRD, UMFCCI, MICPA, Listed Companies and Securities Companies attended the meeting. At the meeting, U Maung Maung Win, Chairman of the Securities and Exchange Commission of Myanmar and Deputy Minister of Ministry of Planning and Finance explained the purpose of the meeting and discussed freely the problems and challenges of the development of capital market, future plan, updates on progress of foreign participation and activities of Special Task Force in YSX.